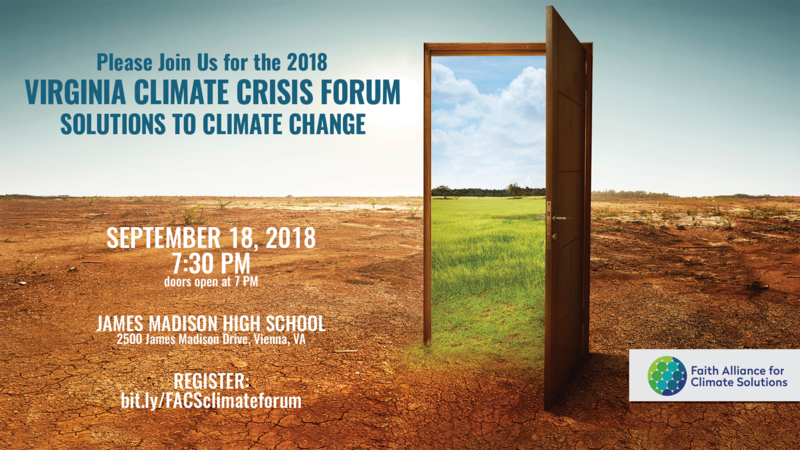 The Virginia Climate Crisis Forum, hosted by Faith Alliance for Climate Solutions, will focus on how Virginia is being and will be affected by climate change. Join in a discussion of the moral and religious imperative to act on climate change. Moderated by Rev. Dr. Jean Wright. The forum is open to the public and free of charge. Space is limited. Doors open at 7 PM. This is a non-partisan, faith-based discussion about policies to arrest climate change. Representing more than 70 congregations in the Northern Virginia area, Faith Alliance for Climate Solutions (FACS) advocates for climate policies in Northern Virginia and in the Commonwealth. We empower and unite neighbors of all faiths to develop local solutions to the climate crisis. FACS is a 501(c)(3) non-partisan organization. We regret that the timing of this event may prevent members of the Jewish community from attending because this falls on Yom Kippur. Yom Kippur is a day of atonement, providing an appropriate context for talking about climate change, taking responsibility and asking for forgiveness for our contributions to this crisis, and resolving to address our failings through personal action.